Casseroles take a long time to cook, but the good news is that they take very little time to prepare. Once the pot is in the oven all you need to do is sit back and enjoy the Middle Eastern-inspired aromas… that, and prepare some rice when the time comes! 2. Heat ghee in a large saucepan (one with a tight fitting lid) over medium heat. Brown lamb all over, about 5 minutes, and remove using a slotted spoon. Add onions and cinnamon quill to the pan and cook for about 10 minutes, until golden brown. Add garlic and cook a further 1 minute. 3. Add lentils, spices, salt and stock and return the lamb to the pan, stirring to combine. Cover with lid and place in the oven for 4 – 5 hours, until the lamb is very tender. 4. Carefully remove the cinnamon quill and stir through spinach. 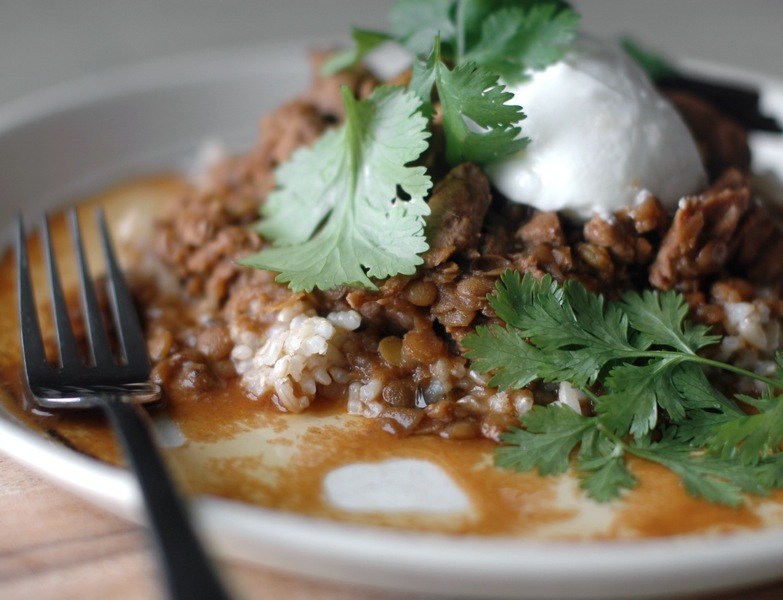 Serve casserole over brown rice with a dollop of yoghurt and coriander leaves to garnish.